I baaaaarely squeaked in a Grainline Archer before December was up! I’ve still got a few hours to post about it here on the West Coast, but I didn’t want to miss Archer Appreciation Month! Jen creates really beautiful patterns, and the Archer button-up is no exception. Things got a little crazy around here this month, thanks to making holiday gifts. In the midst of that storm of fabric and yarn, I decided to head out to Mill End for a few supplies. I spotted this cotton double-gauze I remembered seeing there last year. I was so happy there was still some left! It’s one of those fabrics that you always regret not putting in your shopping cart once you get home. It feels like butter, especially after it’s fresh out of the dryer. Heavenly! 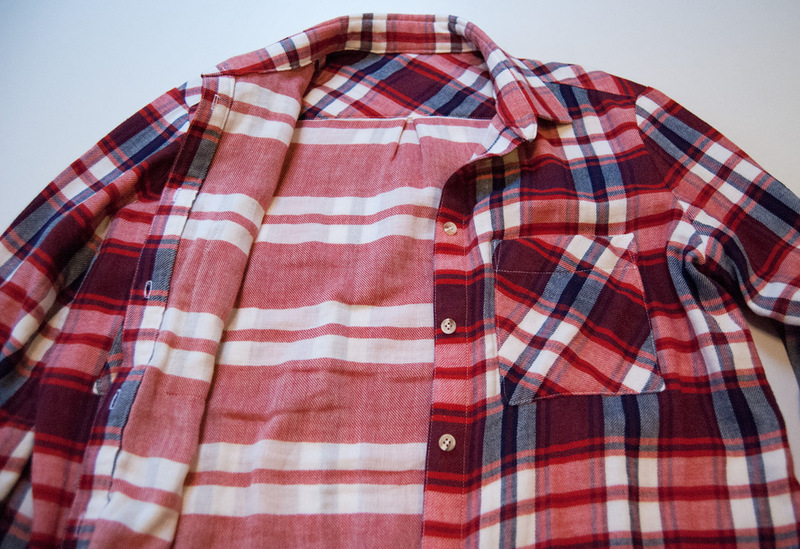 I’ve been meaning to make myself a few button-ups for the longest time. I don’t buy them because they always gape at the bustline, and if I get one to fit my bust, it’s much too large all over. I knew that I wanted something loose, but not too slouchy. I check my measurements against Jen’s pattern, and although my bust called for me to make a size 14, I ended up making the size 10 instead, because the pattern has so much wearable ease. I think for my next one I’ll go down to an 8 to make it a bit more fitted. I didn’t do any other pattern alterations this round. I have a bad habit of completely changing patterns right from the start, and I wanted to see if I liked Jen’s original design before I tweaked it. It’s really nice! It’s roomy, comfortable, and perfect for hiking. When I make my next one, I’ll shorten the sleeves (I should have done that this round but I forgot), shorten the shoulder seam and recut the back neckline to fit my rounded shoulders better, so that the yoke seam comes forward as much as it’s meant to. I already have my fabric and I’m excited to add another Archer to my wardrobe! 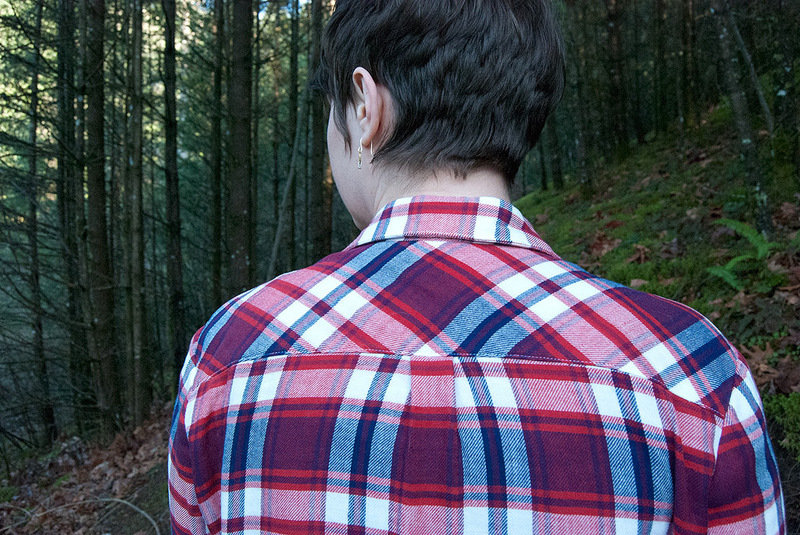 The opposite side of the plaid is a red and white stripe. It’s a nice detail when I rolled up the sleeves, but meant that I had to be particularly careful when cutting out my pieces. 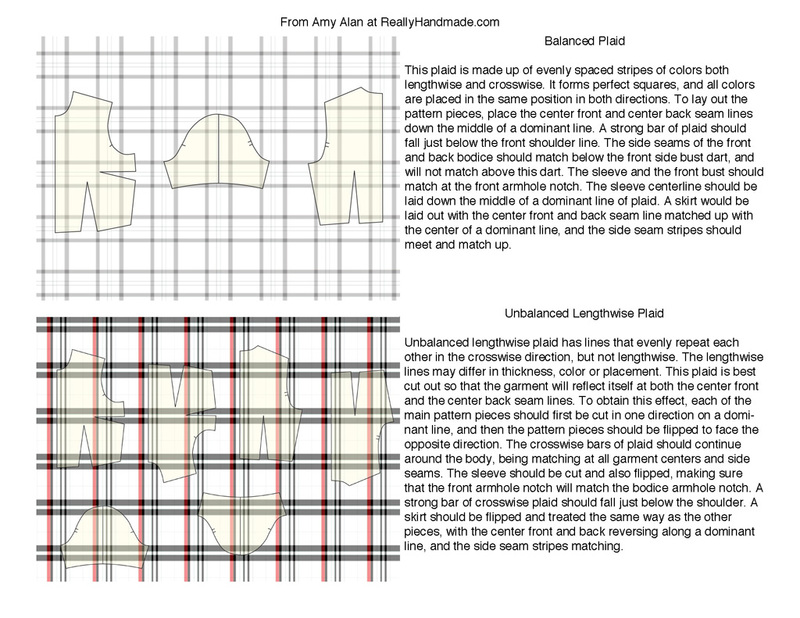 If you’re using a plaid that is one-sided, you have even less room for error! Buttons were not easy for me to pick with this fabric. Rob helped me to find these marbled buttons, and I really like the way they look. I was concerned that the fabric would shift quite a bit while sewing, as it has some loft to it. I used my walking foot and very carefully pinned all of my matching seams. Lucky for me, it worked really well and saved me lots of time with basting. I was quite pleased with the matching along the side seams and sleeve seams! I didn’t want to put too many details on the bias with this plaid. I think it would have been too busy had I put the front button band on the bias. 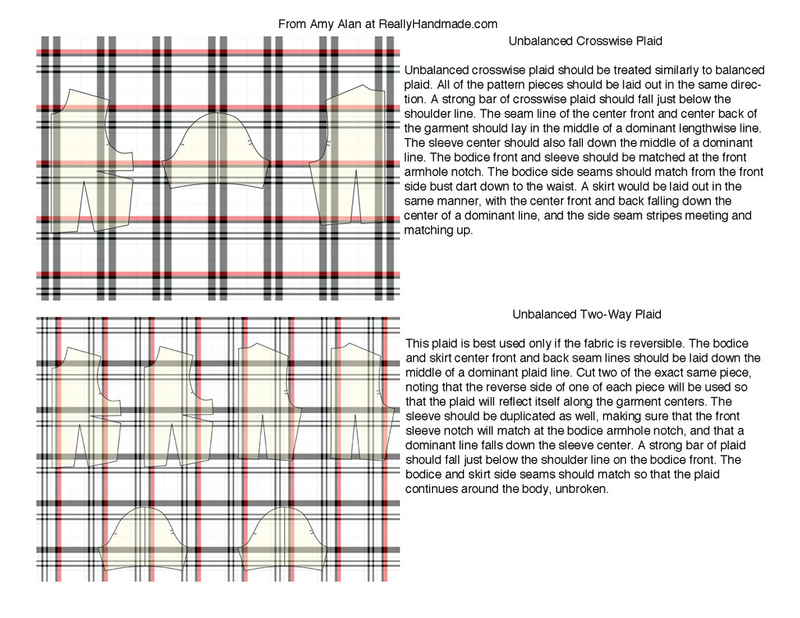 Instead, I cut it out to match the plaid, but I could have simply used the same left fold-under placket piece instead. Next time! The back yoke is on the bias though, along with the pockets. I love this shirt so much! 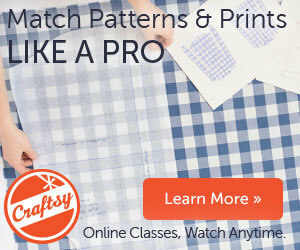 What’s one of your favorite patterns you’ve ever made? I’m always looking for new ones! This entry was posted in Projects and tagged clothing, fabric, plaid, sewing on December 31, 2013 by Amy Alan. 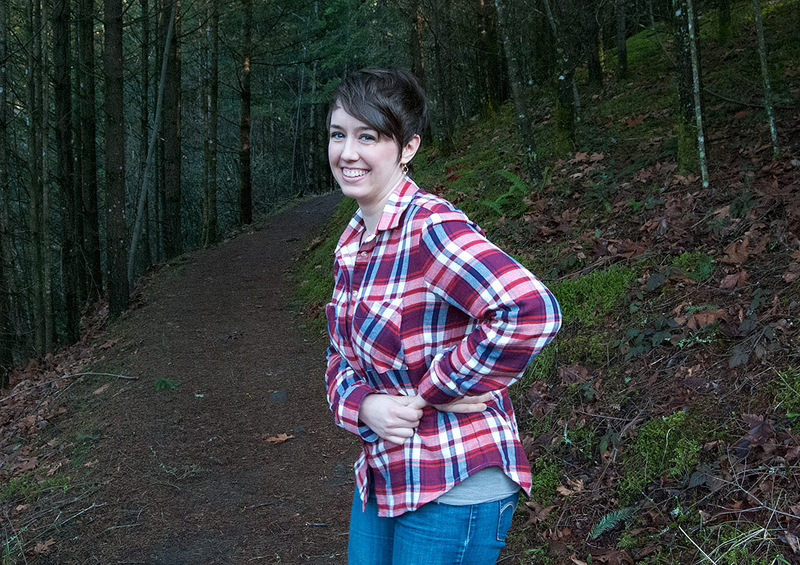 Yes, it’s that time of year again, and you know how I love plaid! See here, here, here, oh and also here if you’re curious. 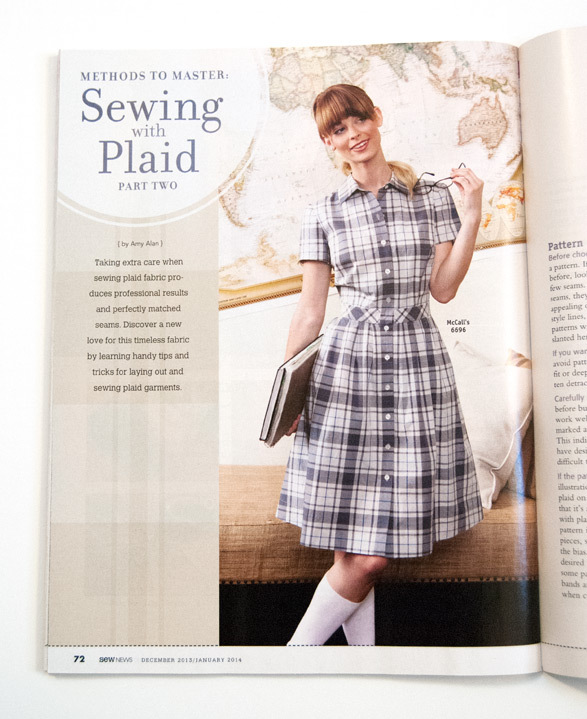 I posted a couple of weeks ago about my first plaid article that was out with Sew News magazine, and now the second half of that article has been released! It’s been out for a while now, but it should still be out on newsstands. It was so satisfying to match the plaids on this dress while sewing it up. What does this half of the article cover? Everything that you would need to know about selecting plaid for a garment and buying yardage, to deciding on your layout and cutting the fabric so that your plaid lines match up perfectly. If you would like the information from both of the articles, it is also available for free online! When I filmed Sew It All, I created a handout for the show. 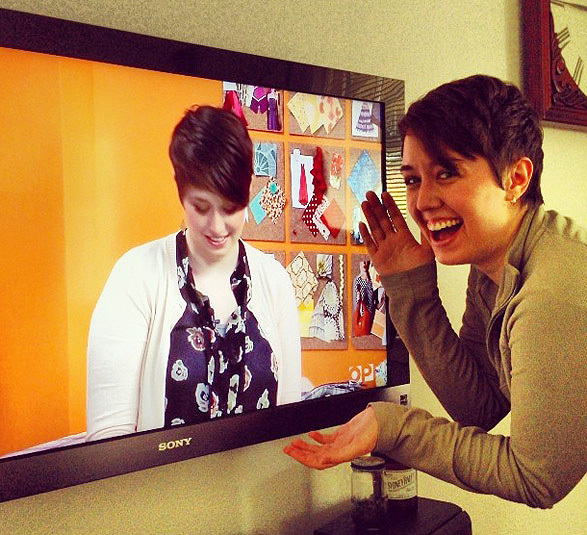 By the way, how weird is it to watch yourself on tv? The answer is VERY. 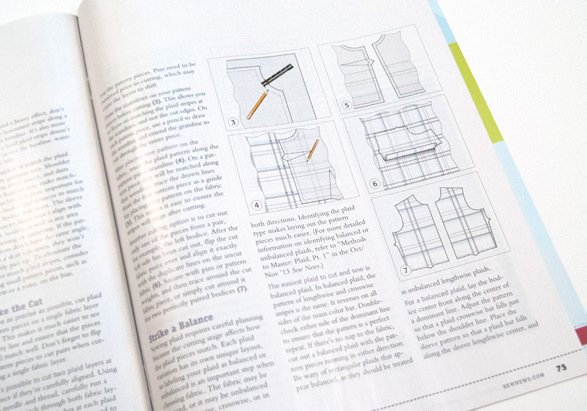 I went my episode page on the Sew It All site, and I found links to both of my articles, along with the plaid handout I referenced to on the show. I think you’ll find this all to be really useful if you’re working on a plaid garment. If you haven’t worked with plaid before, don’t be scared! 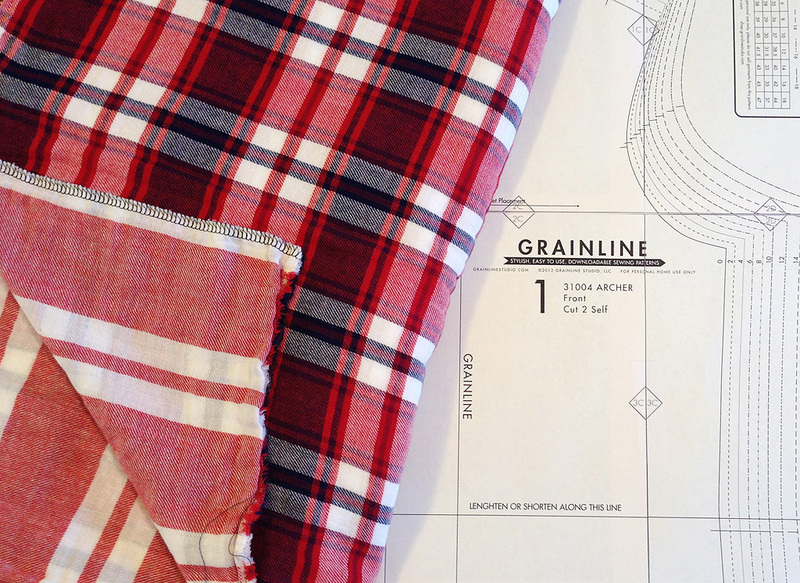 I promise it’s not as hard as it looks if you know how to lay out your pattern pieces so that the plaid lines match right up while you’re sewing. I’ve got all kinds of tricks for you! To download the plaid articles and the handouts, click here. I am partial to the plaid layouts I created for the show. 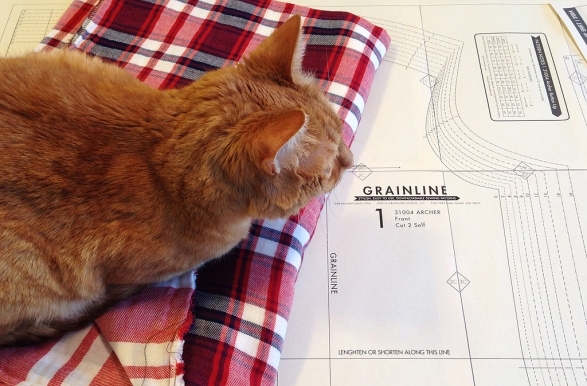 They’re so helpful when you’re trying to figure out exactly how to lay out your pattern pieces for each type of plaid. You can download them online on the Sew It All episode guide, or get them right here by clicking on the images to enlarge the information. I am working on a plaid project of my own right now. 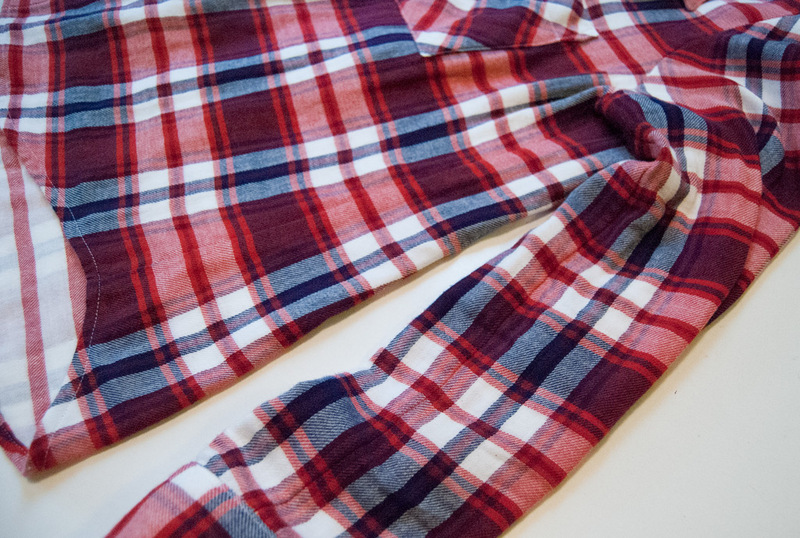 I found this absolutely amazing double gauze plaid at my one of my favorite Portland fabric stores, Mill End, last year. I didn’t buy any yardage then, and I always regretted letting it go. I was checking out the flannel section about a week ago, and lo and behold, there was the fabric! I put it right in my cart and brought home about 3 yards. I am using it to participate in Archer Appreciation Month! The fabric is a dream to work with. I’m hoping to finish it in time to take on a camping trip this weekend. No, that’s not a typo, we’re really going camping. In December. 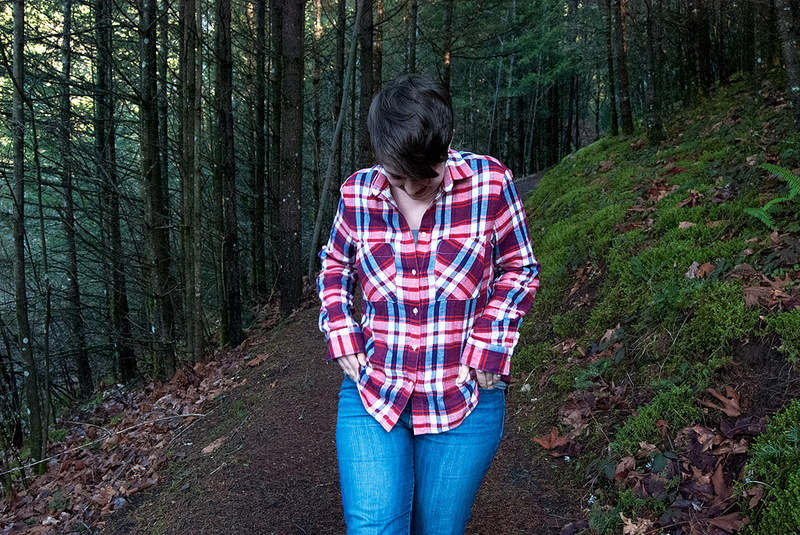 Lots of Oregon state parks have teeny tiny cabins you can rent that are heated, so we’re heading to Silver Falls with friends for a few days of warm cider around a blazing campfire. Hopefully I’ll have photos of my Archer in the wild to share when I get back! 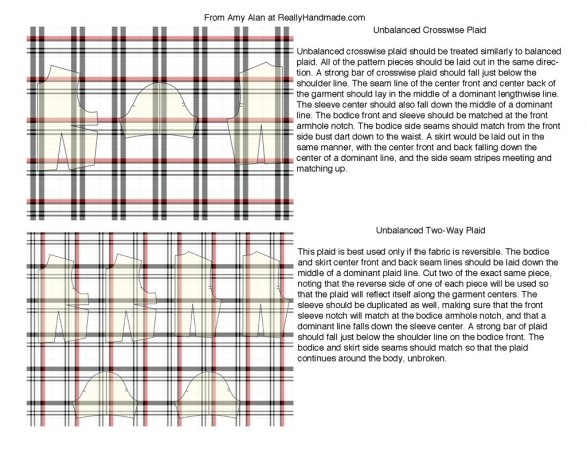 This entry was posted in Fabric, How to Sew, Projects and tagged clothing, fabric, plaid, tutorial on December 9, 2013 by Amy Alan. 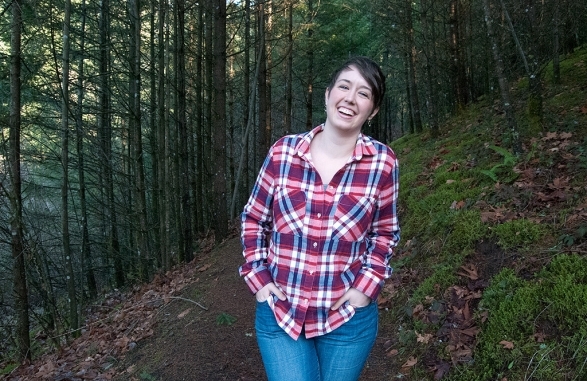 There’s a fairly good chance that if you sew, you’ve heard of Susan Beal. 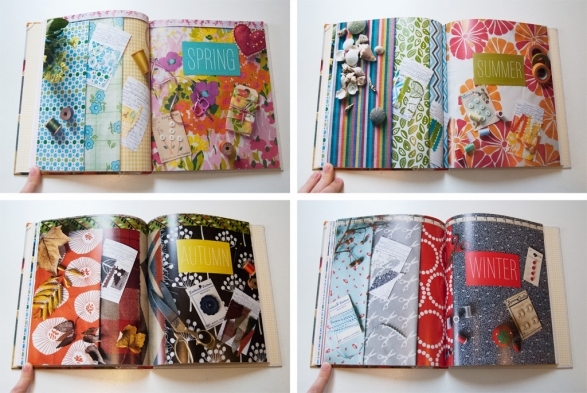 She is the author of many craft books, and her latest publication is just as lovely as the author herself. Susan is one of the nicest people you could hope to meet. I met her when she emailed about including a project in a future book of hers, which will be out in 2014. 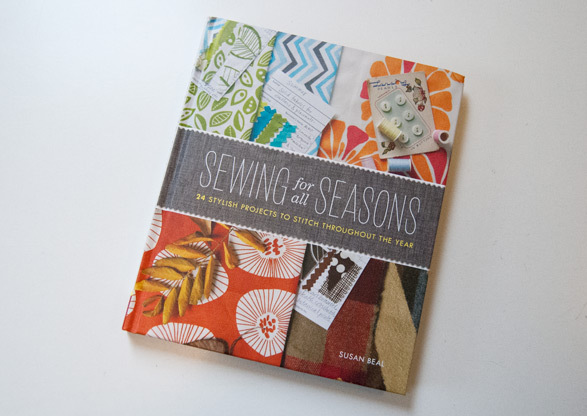 We met for coffee, talked a lot and I was so honored that she asked me not only to contribute to her next book, but to review her latest publication, Sewing For All Seasons. The book is bright, colorful and full of fun and useful projects. I love the pages at the beginning of each seasonal change. They are great for getting you in the mood to make something! I had my eye on two projects in particular. The first one is a coffee cup cozy. I’ve been telling myself that I was going to make one for a long time, because I don’t like the little cardboard sleeves at a coffee shop. 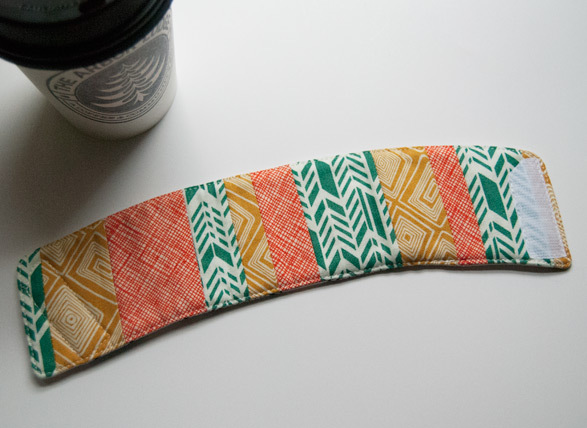 I knew it would be a quick and easy project, but I could never remember to save my coffee sleeve to make a pattern from it. Susan was very kind and gave me the exact fabrics that I would need to make the cozy. 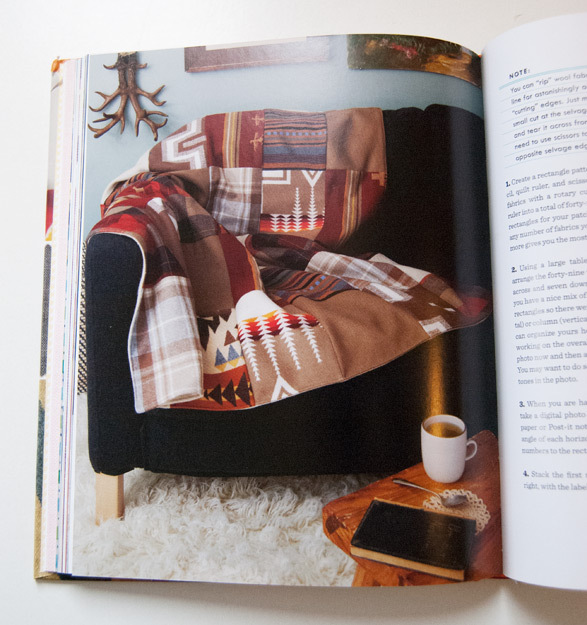 If only she’d given me all of the Pendleton wool I would need to make this amazing blanket as well! 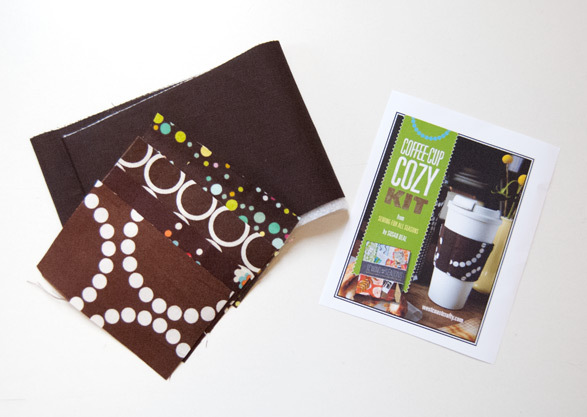 I decided to save the coffee cup cozy kit and use a few of my favorite fabrics instead. I have lots of little scraps that I save for small projects, and this was a perfect use for them. 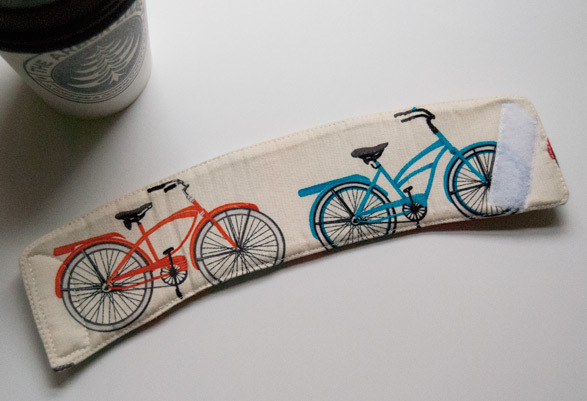 I used a slightly smaller scrap with two bicycles on it for the back of my cozy. Now it’s reversible! I’ve used this many times throughout the past few weeks. 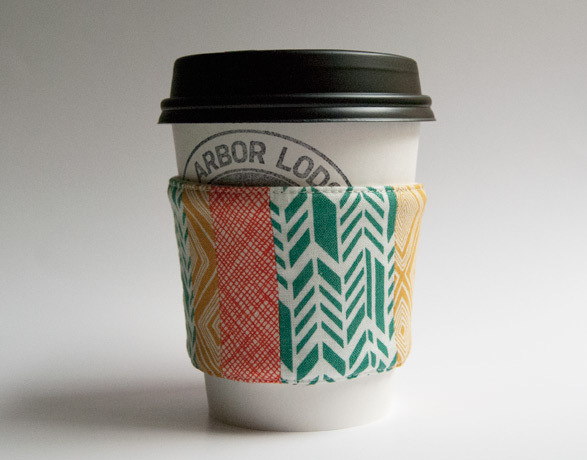 I like getting a coffee to go and pulling out my own cup cozy. No more ugly brown cardboard for me! 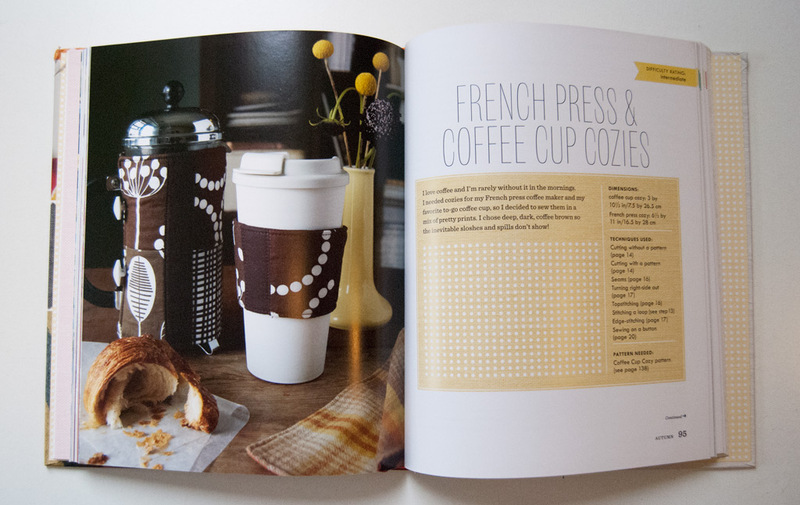 So many of the projects in this book would make great gifts. If you’re like me, you’ll probably be trying to find the perfect handmade gift for someone that doesn’t take a lot of time. What about a pair of slippers? A great beach bag, or stackable fabric buckets? All of these projects (and many, many more) are included in Susan’s book. Would you like to win a copy? All that you have to do is leave a comment on this post by Friday, December 6th at midnight PST. Tell me what you’re currently making (or what you’d like to make) to enter. Be sure to include your correct email address when you comment, so that I can let you know when you win, and get your address quickly so you can have the book in time for holiday making. This giveaway is for US residents only. Good luck! Update: The winner of this giveaway has been chosen using a random number generator and contacted. Congratulations, Susan! 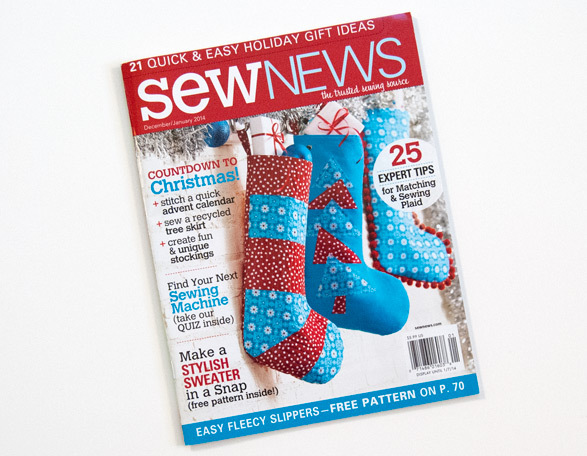 This entry was posted in How to Sew, Projects and tagged giveaway, inspiration, sewing on December 3, 2013 by Amy Alan. I didn’t really know what to expect from London. I knew that there would be a lot see and do, but I was nervous about it. Nervous with both excitement and apprehension, which made me bounce around like a 4 year old at a carnival. I tried to remain nonchalant when our cab driver told us that it took him so long to pick us up because, “You know, it’s London Fashion Week.” I made a mental note to visit Hyde Park as soon as possible. 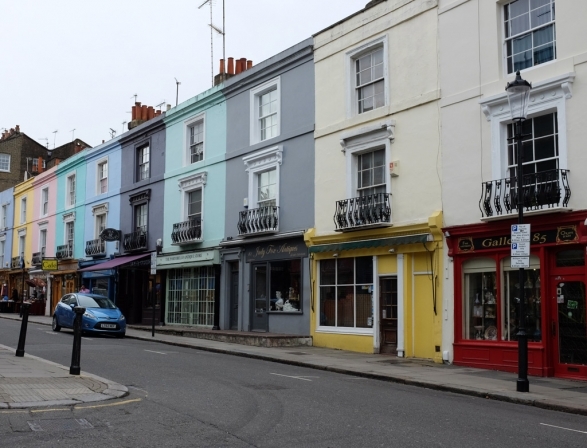 We rented a really great little apartment in Notting Hill. It was bright and clean and located near the tube, which made using public transportation a breeze. I can’t recommend using AirBnB enough if you’re planning a stay somewhere. We used it for almost all of our lodging, and it was fantastic. 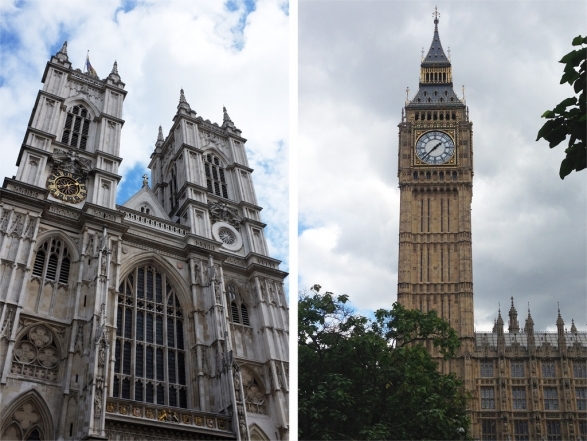 Our first morning in London, we walked around our neighborhood and eventually found our way to Hyde Park. I had forgotten that Kensington Palace was located in the park, and was all too happy to see it. I have loved Queen Victoria since I was in fifth grade and had to do a book report on her. I made a crown for myself out of cardboard, aluminum foil and sequins that was amazing. Alright, you could tell it was homemade by a mile away, but I still loved it. There was something about Queen Victoria’s sadness over losing Albert that resonated with my sappy little heart. 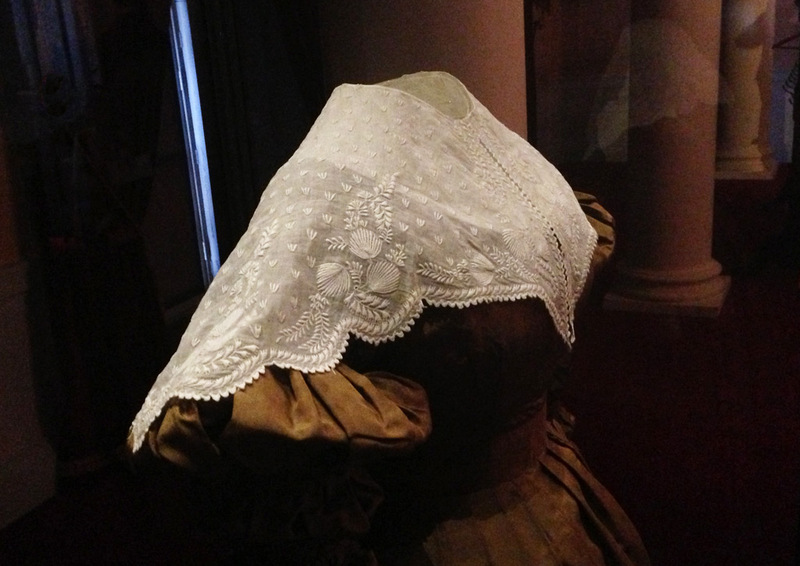 It was so interesting to see in her apartments at the palace and look at the details of her clothes. She was much shorter than I would have guessed! The lace collar on one of her day dresses was quite beautiful, and gave me the itch to embroider again. 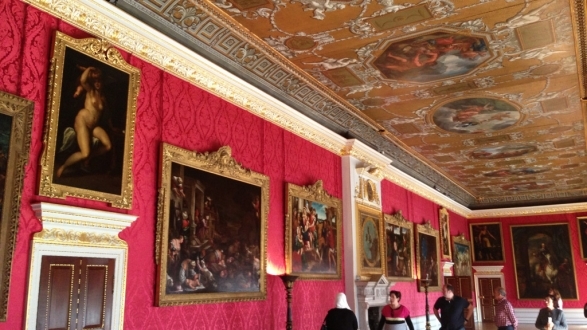 The King’s Apartments were lavishly decorated in the 1700s. It had an over-the-top opulence that was incredible. Every apartment in Kensington is quite different, and reflective of the people who once lived there. There were several displays of costumes throughout the palace. 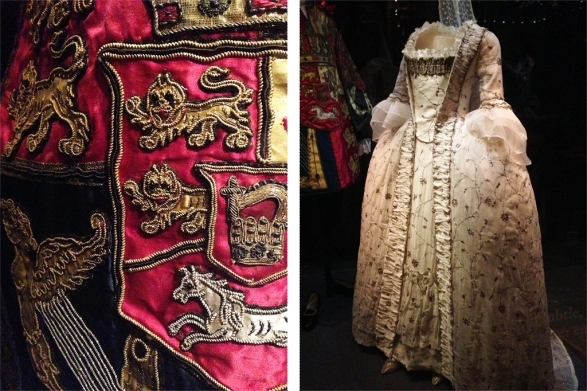 A few of them were never-before-displayed pieces from the Royal Ceremonial Dress Collection. I couldn’t stop oogling the embroidery, thinking of the weeks (months?) that it would have taken to complete some of the garments. One of the displays showcased gowns worn by the Queen Mum, Princess Margaret and Princess Diana. 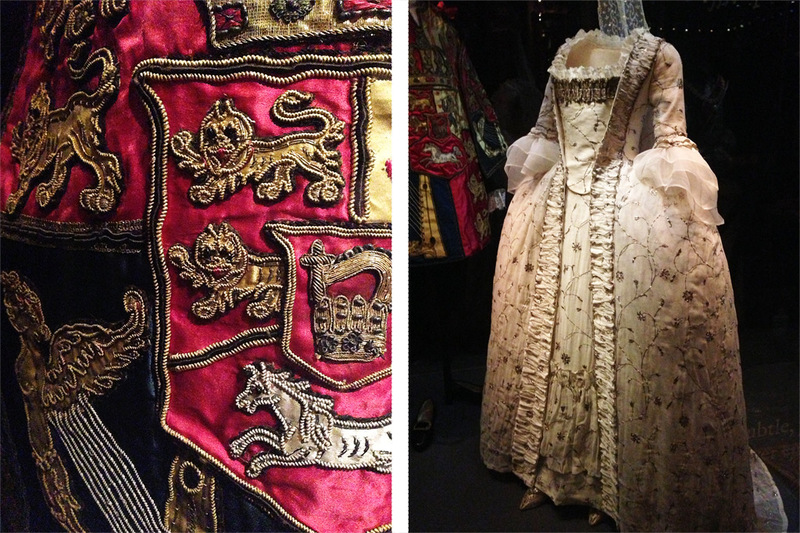 The dress in the lower right hand corner is from the Queen Victoria exhibit. 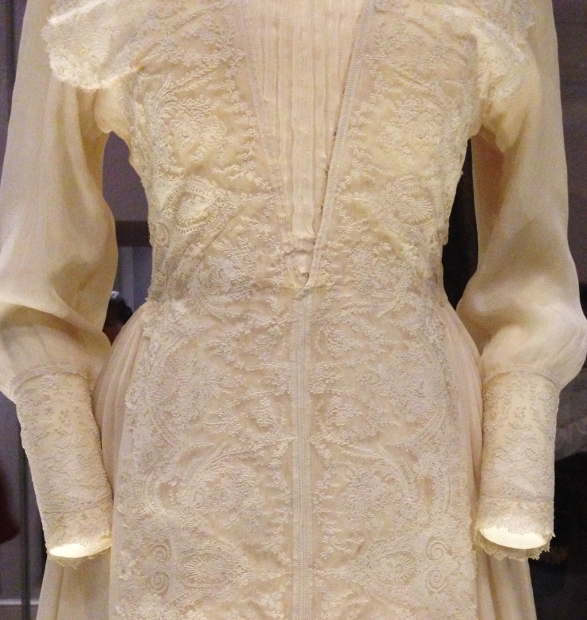 I really enjoyed the lace on a 60s dress worn by Princess Margaret. I’ve got ideas to make something kind of similar, if only I can find the right kind of lace! 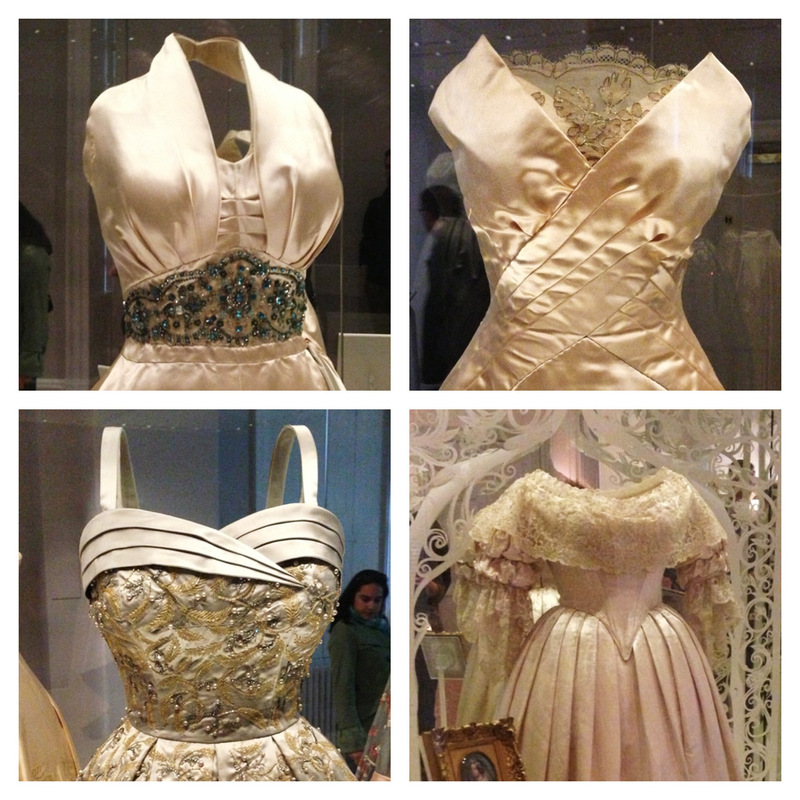 After our tour of Kensington Palace, I had Fashion Week on my mind. I knew that the tents for the shows had to be nearby, and I could tell I was close when I started to see a lot of very tough looking guys in black suits and scowls walking around. 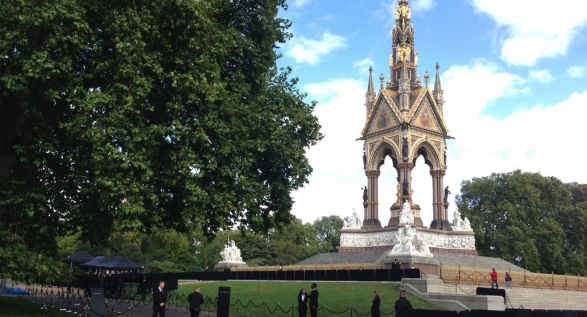 As we approached the Prince Albert Memorial, a large section of the park was blocked off. It was no big deal though, just a runway show for Burberry Prorsum going on! Eeek! We couldn’t really get very close, but from up on the memorial, I could see right in the door. I wanted to try to zoom in an take a picture, but a security guard was giving me the stink eye, so we moved on. Now so far the weather had been lovely, so being the tourists that we were, we trusted the sunshine and left our rain jackets at the apartment. Then of course as we were walking around it start to pour. We were near the British Natural History Museum, so we popped in to get out of the storm. 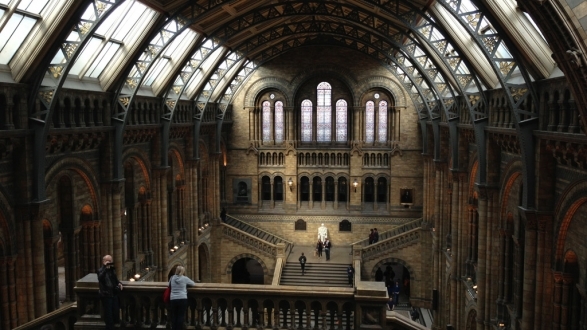 Did you know that the museums in London are free? It’s great! I hadn’t been expecting to spend the rest of the morning at the museum, but it was quite a treat. 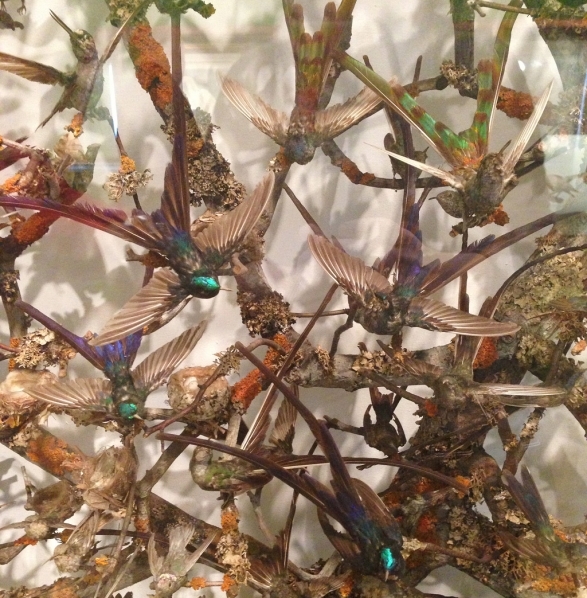 I found a display that showcased every kind of hummingbird, and the colors were stunning. A bit of walking around and we found ourselves in the main hall of the museum, built in 1881. Throughout the museum there were huge displays of ancient creatures, and on the ground floor of the main hall, there is a huge dinosaur skeleton. 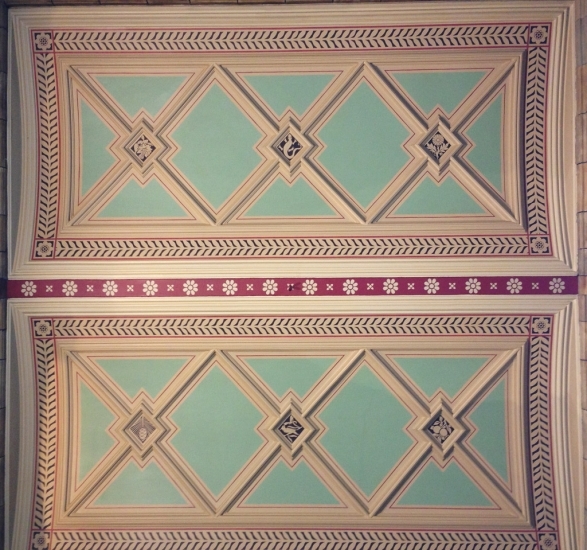 I try to remember to always look up in buildings such as this. 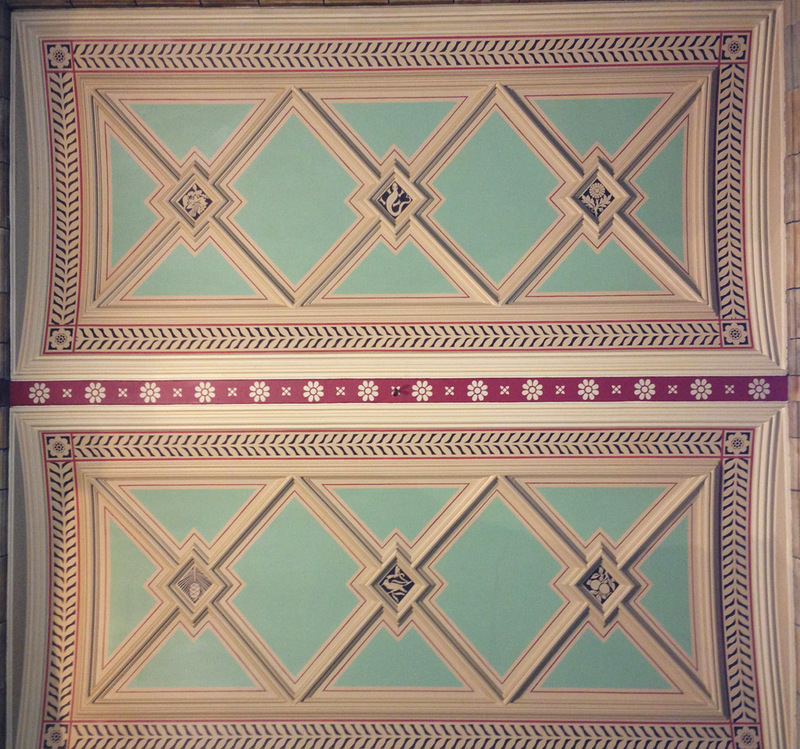 If I hadn’t, I would have missed out on the beautiful aqua and red painted motifs that adorned each curved ceiling panel on the side halls. 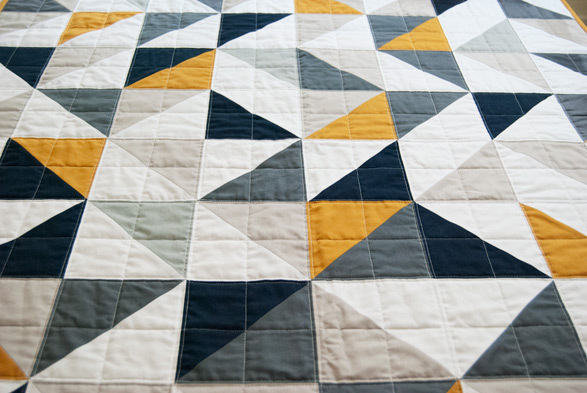 Of course, I see quilts! 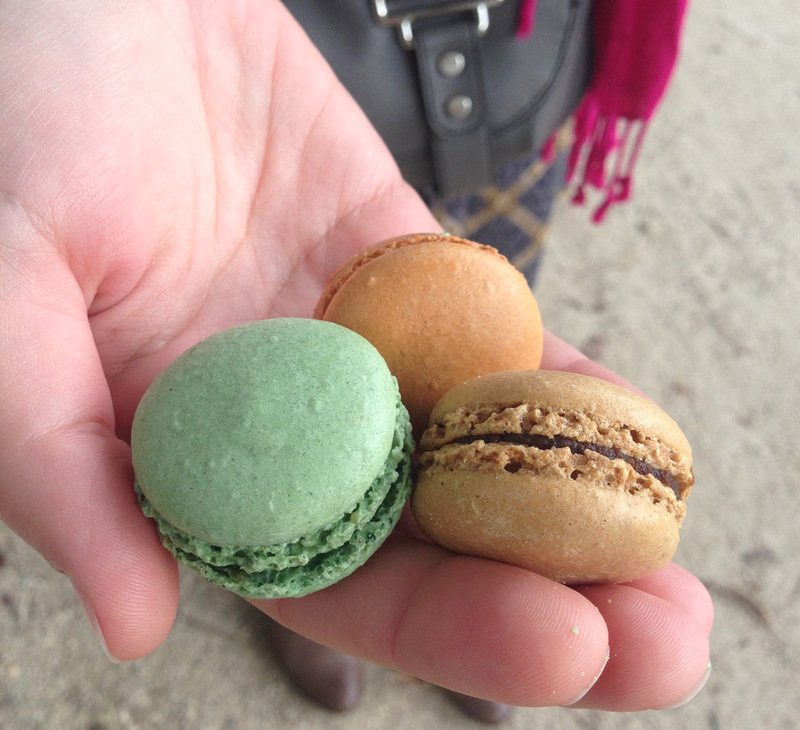 The next day, we walked around our neighborhood to find a cup of coffee. I do love tea, but sometimes I really need a strong cup of coffee before my morning feels complete. Portobello Road was very close to our apartment. We got there early enough that market stalls were beginning to be set up, and shop keepers were arriving to open their stores. It made for some great people watching, and I appreciated that the street wasn’t crawling with tourists. We wandered back on over to where we had been the day before and I finally got to go to the Victoria and Alberta Museum. 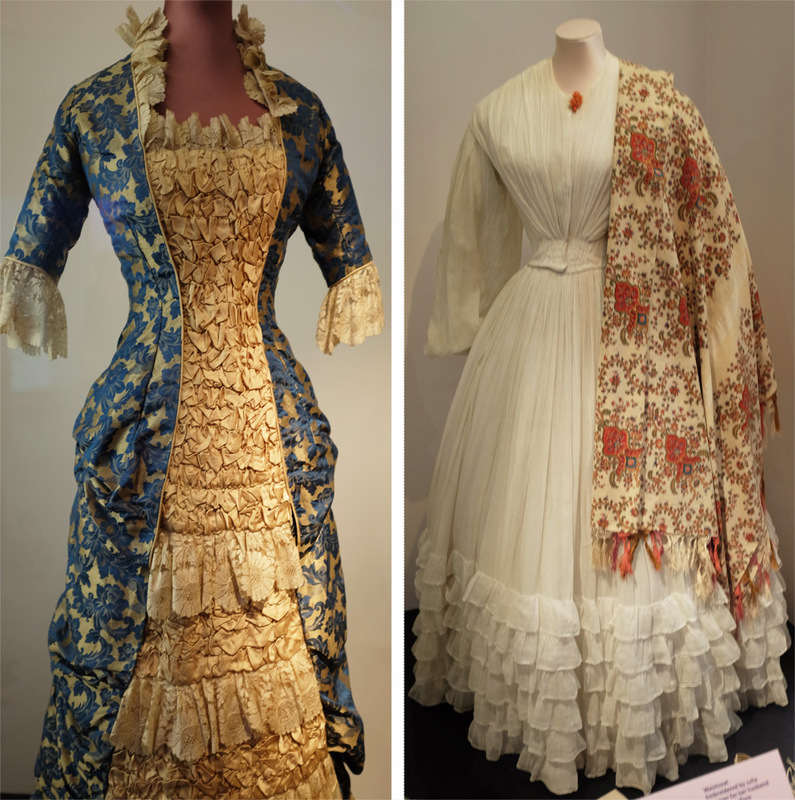 I’ve wanted to go to the V&A for at least 10 years, ever since I saw a book about their dress exhibit. It was jaw-dropping in there. We spent the entire day wandering from room to room, and we still didn’t see everything. I already have plans to go back on another future rainy afternoon. 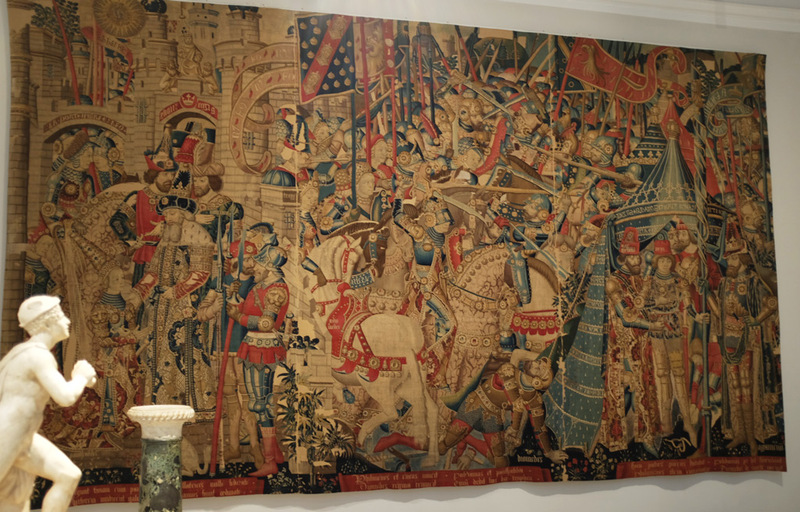 Does anyone else love medieval tapestries? They never cease to amaze me. I like knowing that the colors that we see today are muted from fading over time. 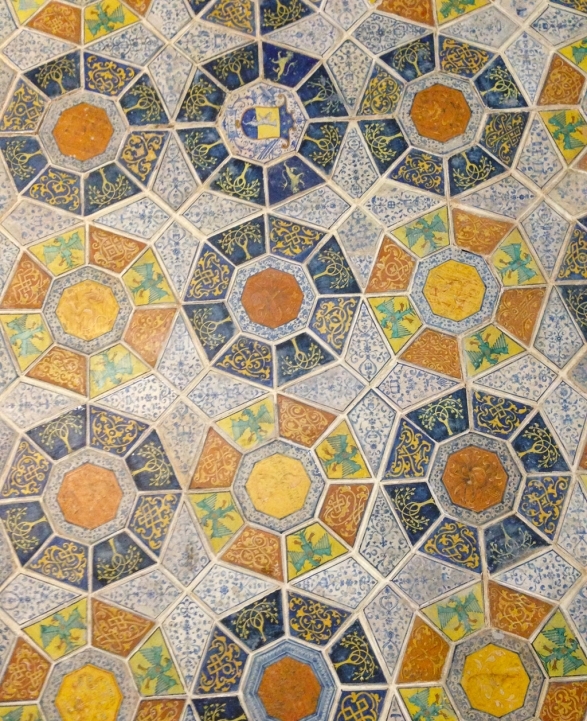 Can you image how bright and colorful this would have been, hanging on a castle wall? The V&A covers every kind of art possible. They have statues and paintings, and also entire building facades and tile floors. This tile reminded me of my Hexagon Illusions quilt, which I need to get back to making! The stitching on the embroidery pieces was some of the best I’ve ever seen. I look at something like this and I think back to the supplies that would have been available to the woman who stitched it. Not even considering the needle and thread quality that she may have had to battle against, what about not having anything but daylight and candle light to see by? 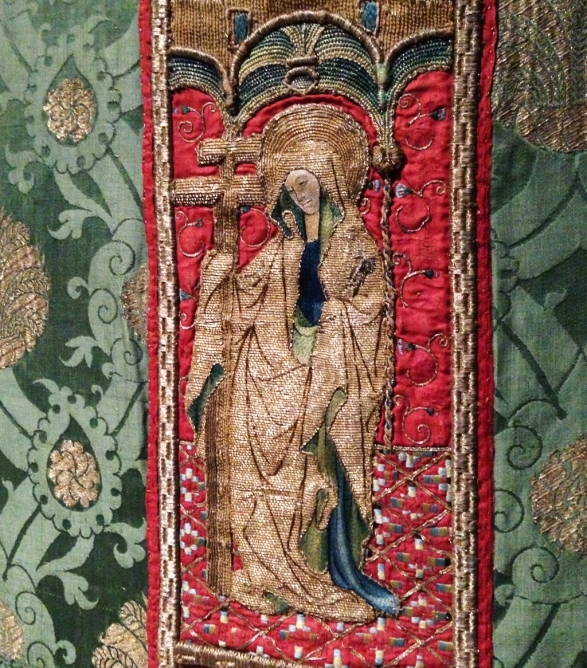 My eyes aren’t that old, but even I wanted a magnifying glass to see the details on this saint’s robe. And talk about old! This tunic was from between 670-870. 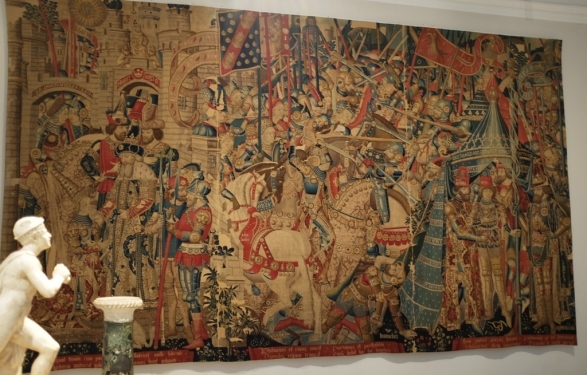 How did something made out of linen and wool survive for so long? The clothing exhibit, which is what I was saving for last that day, was exceptional. Of course, there were lots of people milling about so I didn’t feel like I could hold up the viewing line by pushing my face against the glass and saying “WILL YOU LOOK AT THIS? !”, but know that in my heart, I wanted to. 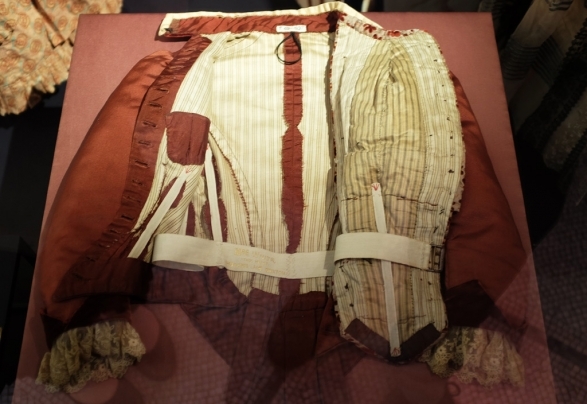 Ahh… any exhibit that lets me see the innards of a garment gets an A+ in my book. The boning on this jacket? 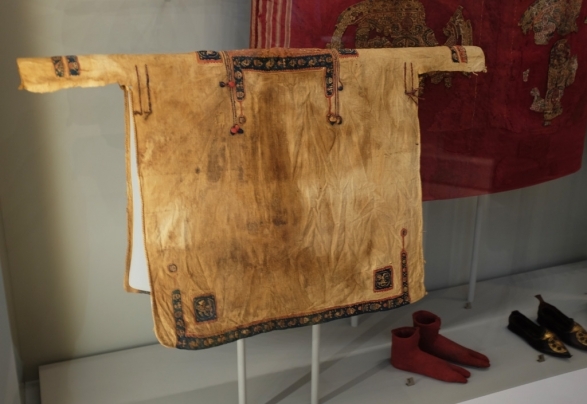 Yeah, it was actual whalebone, and the lining was silk. If only they would let me touch it/try it on/put it in my purse and walk away. Now what’s your guess as to how tall this dress was? It’s certainly not something that anyone can fit into. It’s only 10″ tall! 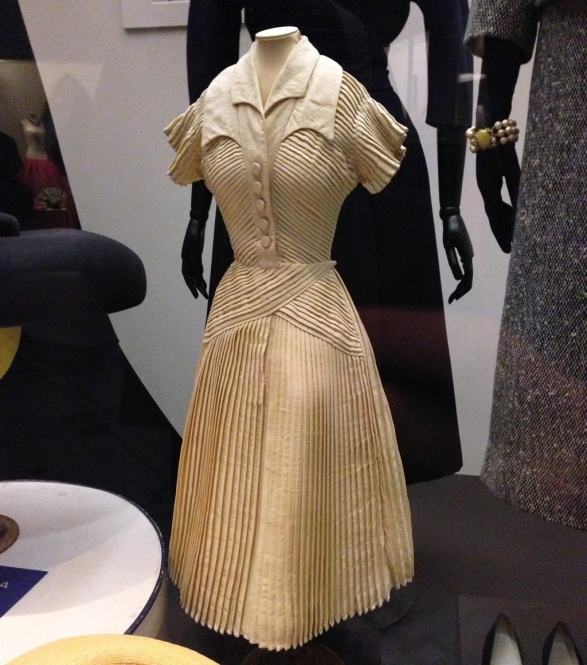 It was made by an unknown designer out of wool, probably to emulate a Dior design. It reminded me of a designer that I interned with in college. She would make everything on a miniature dress form, to save time and money before trying out the dress on a larger scale. Later in the evening we went to Liberty of London, which I personally wasn’t impressed with. 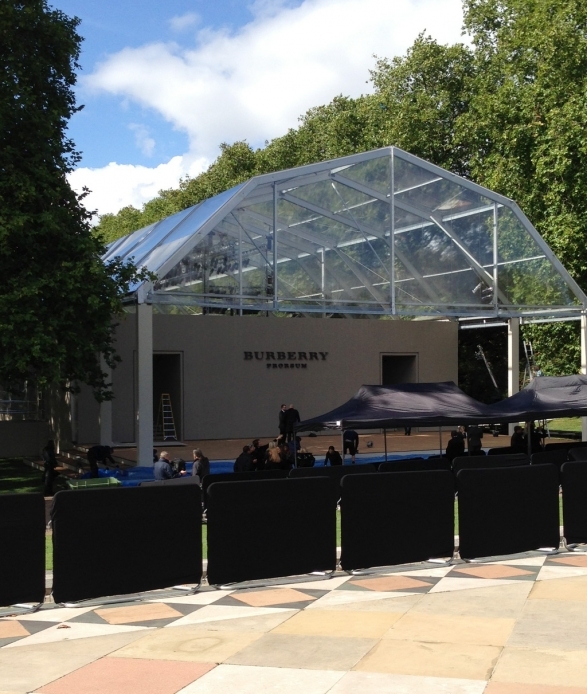 I wasn’t expecting it to be filled with high-fashion names and incredibly expensive goods. Yes, the building was beautiful and their displays were fun to comb thru, but I didn’t understand why everyone had insisted that I go there. Perhaps it’s because I’m not a big shopper, but I don’t think I’d bother going back. We hit the big tourist areas the next morning. 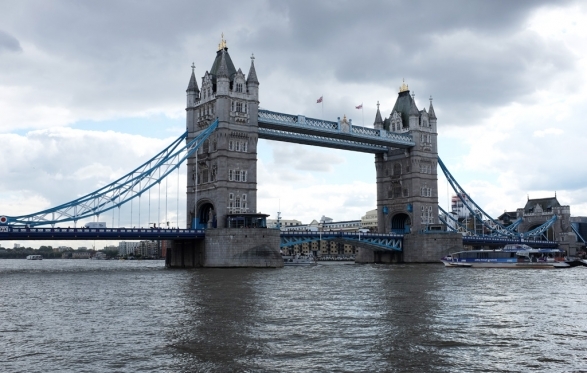 The Tower of London, Tower Bridge, Big Ben, Westminster and Buckingham Palace were all on our list. Granted, we didn’t actually tour any of them, but we saw them from the outside. Neither one of use felt like being herded along on a tour with 60 other people. Hmmm… I think I’m turning into a crabby old hermit. The next morning we hopped on (actually we almost missed it) a train for our next stop…. Paris! This entry was posted in Life and tagged clothing, inspiration, traveling, vintage on November 29, 2013 by Amy Alan. I was unsure about writing this post. I always feel very on-edge when to comes to using someone else’s idea. I’ll see things online that I like, whether they are clothes or home goods, and I think to myself, “Oh, I can easily make that.” I wanted to get your thoughts on this though. What do you think about recreating someone else’s idea? Sure, there are whole blogs dedicated to telling you how to reproduce that necklace from Anthropologie or how to knock-off a designer dress. We feel okay with those things because surely it “can’t hurt” the big company. What about when we use an idea from an individual though? Is it different to use their idea if you’re making it for a gift or for personal use? A friend of mine called me up before her baby shower and requested a very specific quilt design from me. She specifically wanted this quilt, originally made by Crafty Blossom. 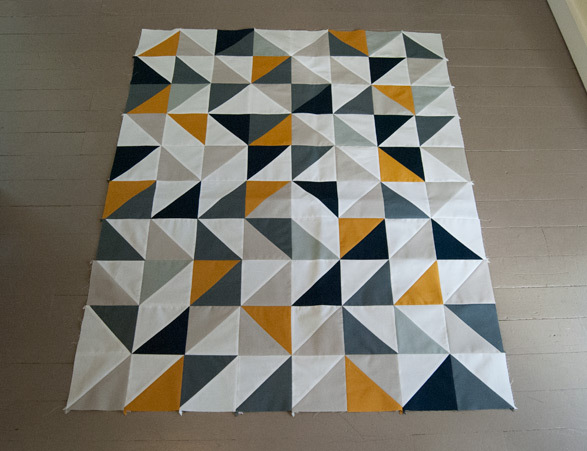 You’ll have to check out the link to see the original quilt, because I don’t have permission to post Erica’s photos on my site. 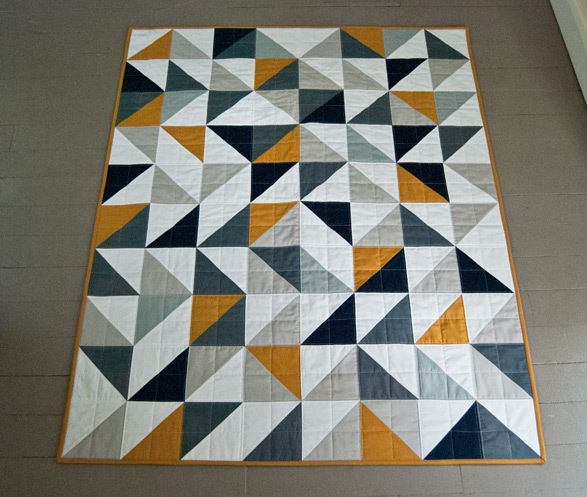 I wasn’t about to tell a soon-to-be-momma that I wouldn’t do it, especially because I loved the original quilt, and hey, the job of picking the colors and the pattern was already done for me! I did feel a little weird about it though. I’ve never copied something that someone else has made. I did my best to match the colors that Crafty Blossom used, and even used her layout, with the exception of a few blocks that I switched around. I think mind ended up being a little larger than hers. I quilted it a bit differently as well, but it still has the same look and feel of the original inspiration piece. The backing was my own idea. My friend got her way with the quilt front, but I had my own thoughts on how the back should look. I used a print of cameras for the middle of the back squares (since her husband is a photographer) and I had to include a strip of the Portland Bridges print! 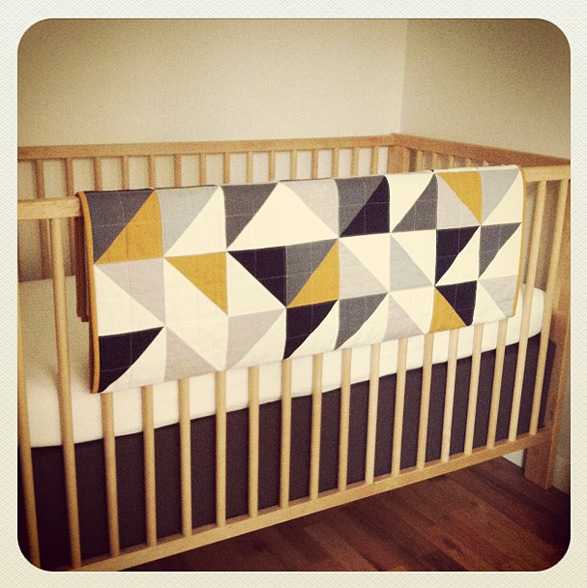 She was really happy with the quilt, and it looks great in the nursery (the photo is from her Instagram feed). I really wanted to share this project and get your ideas on making replicas of the work of others. To clarify, I would never ever make something and sell it when it wasn’t my idea. What do you think about creating a gift like this though? Is it wrong, or is it okay if you are sure to share the original inspiration/idea piece as well? 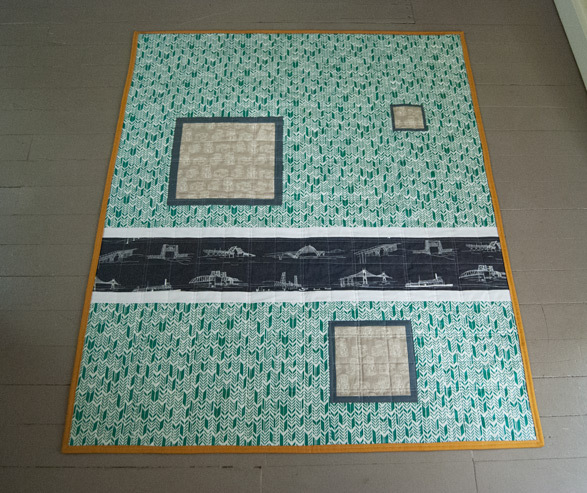 This entry was posted in Projects and tagged quilting, sewing on November 18, 2013 by Amy Alan.